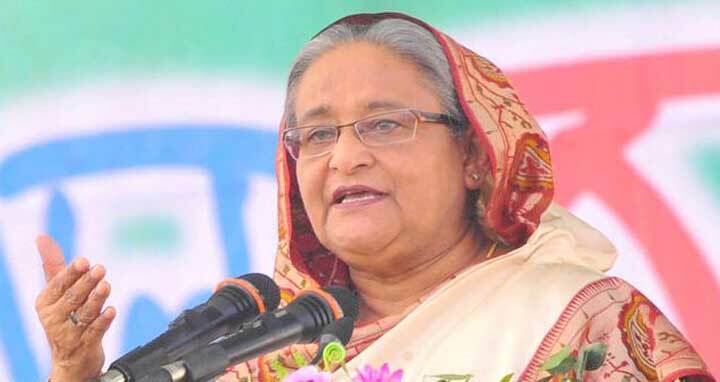 Dhaka, 12 May, Abnews: Prime Minister Sheikh Hasina today greeted countrymen on the launching of Bangabandhu Satellite-1. On the occasion of launching of Bangabandhu Satellite-1, she said, "In the continuous advancement of Bangladesh, another milestone is set today. Today, we launched Bangabandhu Satellite -1." "Through launching this satellite, we have hoisted the flag of Bangladesh in the space. I would like to greet and congratulate the countrymen on this glorious occasion," the Prime Minister added. "I recall with deep gratitude the greatest Bangalee of all time, Father of the Nation Bangabandhu Sheikh Mujibur Rahman. I remember three million martyrs and two lakh women who lost their dignity during the War of Liberation," she added. Bangabandhu realized that without being able to keep continuous communication with the outside world, it won't be possible to move forward to the path of progress and prosperity, the Prime Minister said adding within only three years of liberation, he inaugurated the first satellite earth- station at Betbunia of Rangamati in 1975. "Through launching the Bangabandhu Satellite-1 we are moving forward by another step in materializing that dream of the Father of the Nation," Sheikh Hasina added. "We have relentlessly been working to build a 'Digital Bangladesh' since 2009. We have expanded the Internet services up to the union level. Initiatives have been taken to develop two million young ICT professionals by 2021," she added. The Prime Minister said, "We have already achieved the third position in the world in Internet freelancing. Hi-Tech Parks are being built to promote business opportunities for local and foreign investors." "We have connected submarine cables with SEA-ME-WE 5 for easy and affordable Internet. Our government has established a state-of-the art data centre," she said adding, "The satellite will be a great addition to our Information Technologies heralding our entry into the satellite club of the world." "Bangabandhu Satellite-1 will certainly make for revolutionary changes in our broadcasting and telecommunication sector," she added. "I would like to extend my heartiest thanks to the officials of Posts and Telecommunications Division, BTRC, the Project and Bangladesh Communication Satellite Company Limited, who are associated with manufacturing and launching of the satellite," she added. "I would also like to thank Thales Alenia, the satellite manufacturing Company of France for the construction of Bangabandhu Satellite-1 and Space- X, USA, which was responsible for launching Bangabandhu Satellite-1. I would like to thank Russia for giving us the opportunity to use their orbital slot."